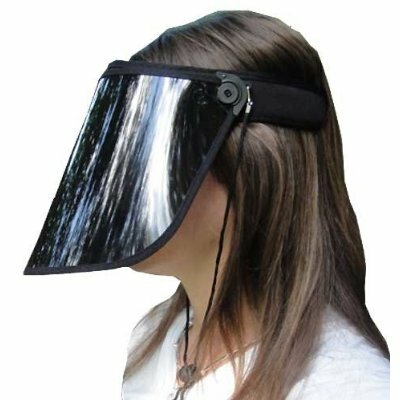 The Solar Face Shield is an alternative approach to full protection for your face from any potential harm from the sun. The shield fully covers your face blocking any harmful rays from reaching your delicate facial skin. Though it may not be attractive (except possibly to starwars fans) it is an effective way to protect your face without the need for chemical blocks such as sunscreen. 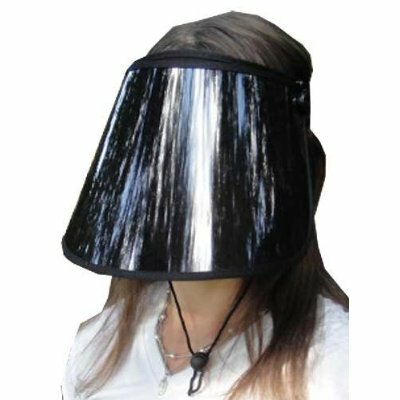 The Solar Face Shield may look rather peculiar and odd and it is, however it does have some environmental benefits over the use of sun creams/sunscreen. The different creams must be applied very regularly, many make the mistake of thinking one application will last all day, additionally more is required than many often use, a thick layer is often needed to work effectively and ensure all the facial skin is properly covered. This high usage means many bottles of the creams, lotions and blocks are required, each contributing to manufacturing of chemicals, plastics, and the transportation to get the products to consumers. The Solar Face Shield fully protects you and will last a very long time if treated correctly. Though it may only cover your face sensible clothing can help to protect your body ensuring you can be protected in the sun without the need for chemicals. The shield offers 50+UPF protection and 99% of UV protection too. The shield is adjustable, allowing it to be worn up as a visor when required and has a padded sweatband to provide a comfortable fit. The Solar Face Shield is an alternate option for those that wish to protect themselves from the sun but do not wish to use chemicals, creams and lotions.